In the late 1960s The Marx Toy Company had a major hit on their hands with Johnny West and The Fort Apache Fighters. Plans to expand the line included the Noble Knights, but also a couple of products that never made it to the general public. 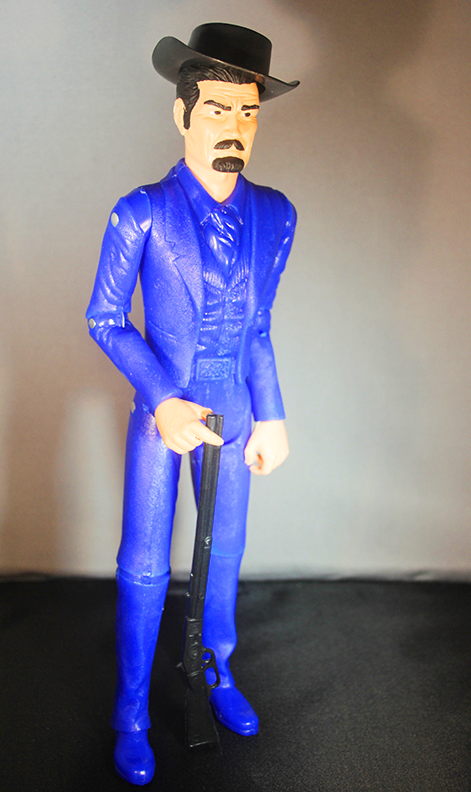 One of those was to be a Johnny West-sized figure based on the hit TV show, The Wild, Wild, West. 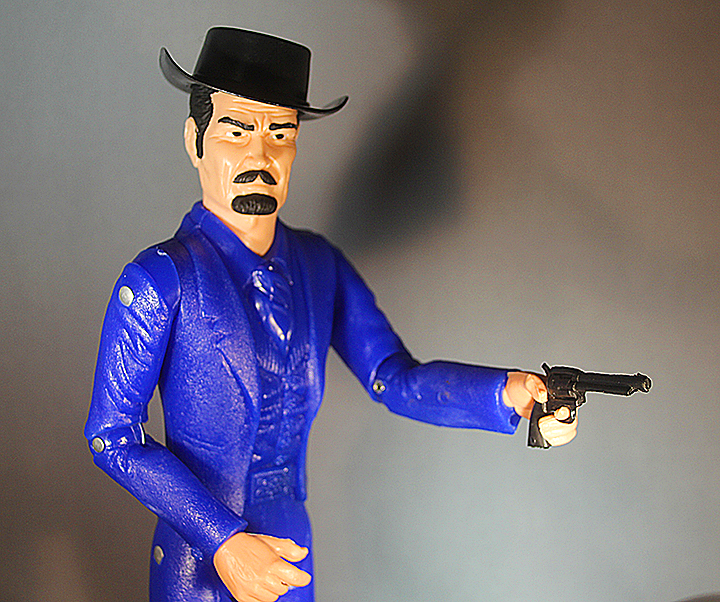 This figure made it as far as the product sample stage, and there is a black-and-white photo of a mock-up of a store display that shows this figure, with The Wild, Wild West logo and all the accessories. You can find that photo in one of Tom Heaton’s Marx books, which are available at his website, The Vintage Toy Room. 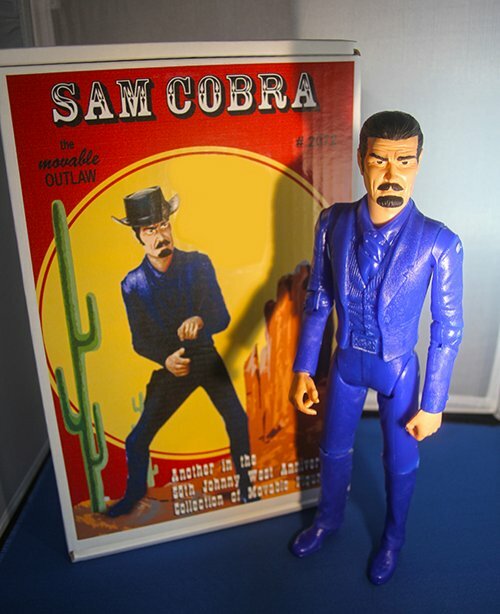 In the photo you can see a lighter-colored body made with the Sam Cobra mold, a headscult that resembles Robert Conrad, the star of the show, and all of the intended accessories…all 28 of them (three more than came with Sam Cobra). Nobody knows why this project never came to fruition. The timing is even suspect. Speculation is that CBS wanted too high a licensing fee and Louis Marx played hardball and killed the figure. There is also a belief that the show was canceled before this could hit the market, but that theory is debunked by the timing. The timing comes into play becase, once The Wild, Wild West figure was killed, the decision was made to salvage as much of the design and tooling work that had gone into it as possible. 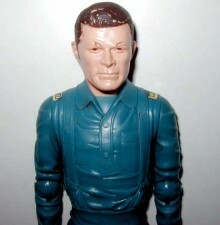 Almost immediately, the head of James West, a very good likeness of actor Robert Conrad, turned up as the head for the “Captain Maddox” figure in the Fort Apache Fighters line. This figure was first released in 1967, so that makes the theory that it was a dispute over the rights fees that led to The Wild, Wild West line being halted more plausible. The show wasn’t cancelled until 1969. In fact, two of the other Fort Apache Fighters sported repurposed heads: Bill Buck had the same head as a prior Daniel Boone figure that resembled Fess Parker, and Zeb Zachery bore the likeness of actor, Christopher Jones, who starred in a Jesse James television show. Glamour shot of the Outlaw, photo by Mark Wolfe (as are all but one in this post). .When it came to the accessories, they decided not to change much. Nearly every accessory sold with Sam Cobra has some inspiration taken from The Wild, Wild West. 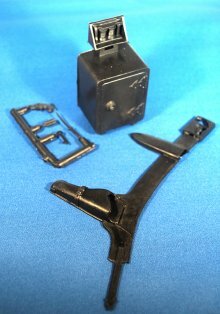 You had the carpetbag, the exploding pool ball, the holster with a pop-out Derringer in the buckle, the stilleto knife up the sleeve, a safe…there was only one change made to the accessories, and that was to seal off one mold chamber which included the heads for three Halberds–Medievel weapons that turned up in many episodes of the show. 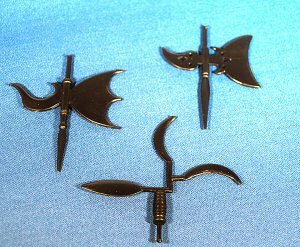 Originally these heads would fit on the ends of three pool cues to form the full weapon. Without them, Sam Cobra simply had three full-sized pool cues (and one that pulled apart to become part of a rifle). That was always a bit of a head-scratcher, because kids didn’t realize the origins of Sam Cobra. We thought that maybe this was some kind of vindication of Harold Hill, and that it meant that pool really was an evil game. Just a few of the accessories, including the infamous belt, and the most-easily-lost pieces, the key, the two-piece Derringer and that gunbelt. Nobody even knew about the Halberd heads until Tom Heaton turned up the photo of the mock-up store display. Now it makes sense. Earlier this year, when the molds for Sam Cobra and his accessories were dug out of storage in Mexico, it was discovered that the mold chamber with the missing three pieces could be put into production with a minor modification. 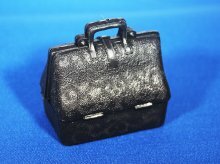 It was decided to do that, so for the first time, we get the full set of accessories that were originally intended for Treasury Agent, James West. This is a really cool anniversary package. The figure is made with virgin vinyl in a vibrant cobalt blue (matching the color of Agent West’s suit in The Wild, Wild West) and he comes with 28 accessories and a signed certificate. This figure is limited to a run of 200, numbered figures in a special box. I’m sure that I’m not the only person who’s going to pick up an extra figure so that I can switch heads with Captain Maddox and have a long-delayed Wild, Wild West figure. The detail on the accessories, even with molds many decades old, is amazing. This set does duplicate one weakness of the original Sam Cobra. 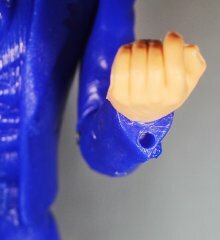 None of the accessories are produced in soft vinyl. This means that the elaborate gun belt with the swing-out Derringer does not fit well on the figure. Luckily, CXR has produced this belt in soft vinyl and modified it to fit the figure better, so you can order one of these “Renegade” belts if you want to fully outfit your outlaw. The figure looks spectacular even without it though. 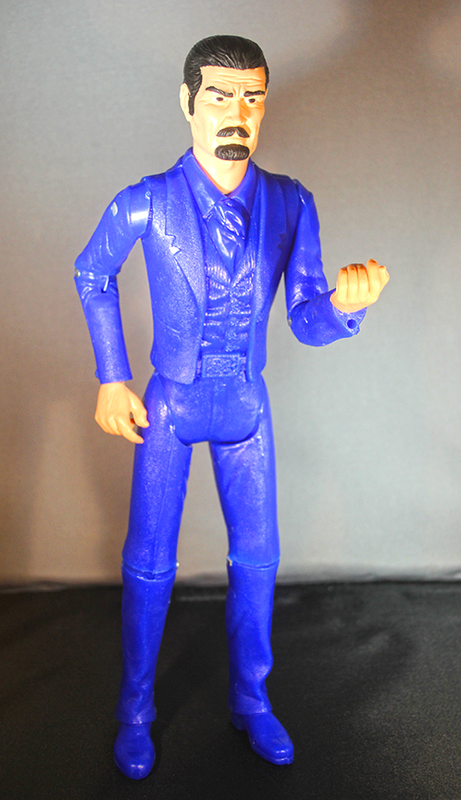 The Johnny West Anniversary Series Sam Cobra figure is a perfect combination of nostalgia and customizing fodder, for fans of the original Johnny West line of figures from Marx. It duplicates the heft and feel of the original and I have to admit it, Sam Cobra looks mighty sharp sportin’ his new duds. Thanks again to Mark Wolfe, who ,along with your PopCulteer, pretended like he was working as an excuse to play with toys. If you would like to order this new 50th Anniversary Sam Cobra Limited Edition signed and numbered set, contact James Wozniak at the email address you’ll find HERE. If you’re a die-hard Marx collector, check out his eBay store and poke around his website. He has tons of other Marx 12″ reissues available. Scott Stewart, who designed the box art, has some great 12″ Marx (and other companies) stuff at his website alongside vintage Marx and other cool 12″ action figure gear, and he also has an invaluable online guide to collecting Marx action figures. If you want to inquire about any of the fine CXR Johnny West accessories or figures, contact Terri Coop through her website HERE. Check out Mark Wolfe Design for all your photography, graphic design, web design and action figure photo shoot needs.